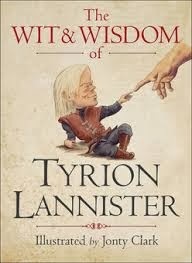 I have to begin by saying that I’m a huge fan of Mr. Martin and his work and that Tyrion Lannister is one of my all time favorite literary heroes. In fact I’d dare add that I didn’t enjoy A Feast for Crows as much as I should for the simple reason that Tyrion was nowhere to be found. However, having said that I just have to point out that in my opinion this book came out a few years too early. Since dear Tyrion is still alive and kicking I’m certain that he’d be able to grace us with many more of his witty remarks. Oh well, there’s no use complaining about something that’s already done. Did this book make me smile? Yes it did, since it reminded me once again what is it that I like about this character. I should also say that the beautiful drawings also capture some of his persona as depicted in the TV series. But, yet again, there’s not enough material in here to keep the fans happy. Perhaps the next book published in this vein should be The Transformations of Arya Stark, who’s not a lady but a wolf.